From the relaxed roof terrace of the Fontecruz, on busy Gran Vía de Colón, to the romantic patio of the Parador de San Francisco, within the walls of the Alhambra itself, Granada hits the mark if you are looking for luxury accommodation in one of Spain’s most beautiful cites. 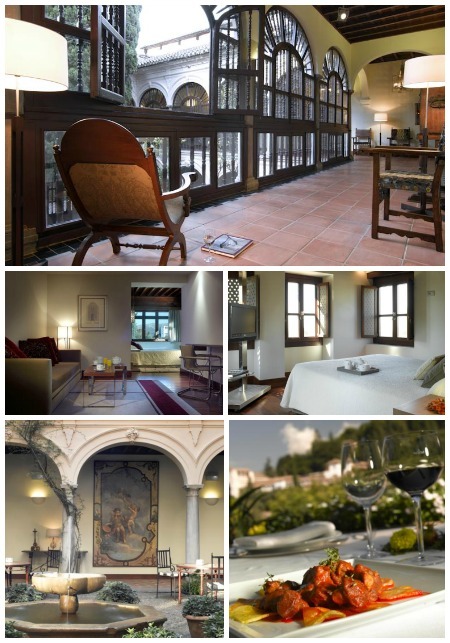 One of the best 5 star hotels in Granada is the AC Palacio de Santa Paula, part of the Marriott Autograph Collection, which occupies the former 12th century Casa Morisca, and 16th century Santa Paula Convent. Located in the heart of the city on Granada’s smart and busy Gran Vía de Colón, the building itself is protected and offers the perfect mix of modern luxury and a more individual historic charm. This is most clearly reflected in the hotel’s El Claustro restaurant which occupies the old convent refectory and offers a fusion of contemporary haute cuisine and traditional Andalucían gastronomy. As you would expect of a 5 star establishment, Palacio de Santa Ana’s 75 air-conditioned rooms have minibar, flat screen TV, WiFi and CD player. There is also a gym, sauna and Turkish bath available to guests. Private parking is possible on site (reservation is not possible) and costs €21.18 per day. 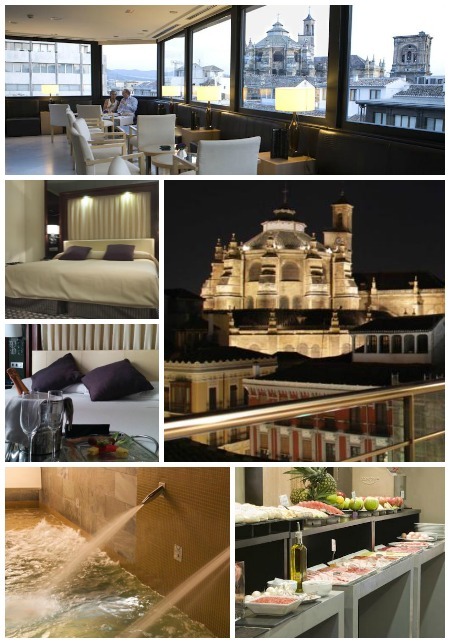 The hotel is close to Granada Cathedral and a short walk to Plaza Nueva and the historic Albayzín barrio. The Alhambra is a 10-minute taxi ride. Old meets new at Palacio de los Patos, an elegant luxury hotel set in a UNESCO-protected 19th century palace, not far from the Cathedral. The hotel offers 40 beautifully light, airy rooms either in the Palacio itself, where original features have been conserved alongside contemporary refurbishment, or a modern wing that is more minimalist and sleek in décor and design and makes use of materials such as stone, glass and metal. The hotel’s restaurant serves fresh, healthy cuisine in the Andalucían culinary tradition and the garden, which features Arabian-style fountains offers an oasis of peace in the city centre. All air-conditioned rooms have flat-screen satellite TV, WiFi, safe and minibar. The hotel spa, which includes a sauna, Turkish bath and indoor pool also offers massage and other beauty treatments. Parking is possible on site (reservation is needed) and costs €26 per day. Pets are allowed on request. 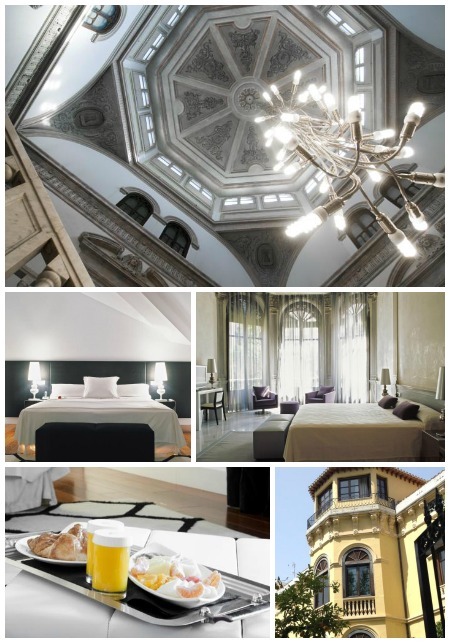 Another sophisticated Gran Vía property is the boutique hotel Eurostars Gran Via (previously the Fontecruz). Set in a stylishly refurbished Renaissance building, it offers 39 spacious rooms in the city centre only a stone’s throw from the Cathedral and bustling Plaza Bib Rambla. The hotel’s restaurant, Mama Mia, offers Italian cuisine. Another popular hangout is the roof top terrace bar where you may even catch a live jazz session on a summer evening. The views from the terrace of the Cathedral, the iconic Alhambra silhouette and the Sierra Nevada backdrop are stunning. The hotel spa offers a range of health and beauty treatments and a hydrothermal circuit. All rooms are air-contitioned, with minibar and TV and there is free Wi-Fi available throughout the hotel. Public parking is available nearby and costs €22 per day (reservation is not required). Set in the 15th century San Francisco Convent, within the grounds of the Alhambra, the luxurious Parador de Granada boasts one of the most romantic locations in the city. Built on the site of one of the Nazrid palaces, on the orders of the conquering Catholic Monarchs, this historic building offers an effortless combination of original features, such as stone archways, beamed ceilings and antique furnishings with smart, contemporary décor. From the restaurant dining room and terrace you can take-in spectacular views of the Generalife Gardens while enjoying traditional Andalucían fare. There is also a lovely enclosed patio, where guests can relax and keep cool with a drink. Each of the Parador’s 40 rooms has free internet access, a flat-screen TV and air conditioning. Free private parking is available on site without reservation. Granada’s old town is an enjoyable downhill 10 minute walk from the Parador. There are also regular buses and plenty of taxis available. For more details on visiting the Alhambra click here. Don’t want all the hassle of buying tickets and queuing for the Alhambra Palace and Generalife? Book Alhambra tour tickets now and skip the line! 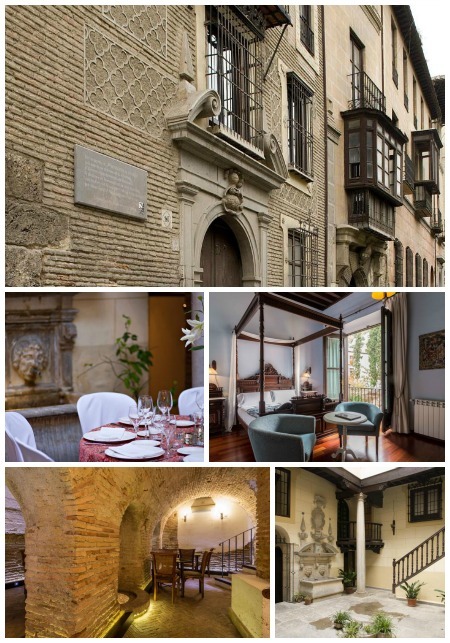 Named after the revolutionary martyr who lived on this site in the 19th century, Palacio de Mariana Pineda offers only five rooms on Granada’s most beautiful street, the Carrera del Darro. Information on it’s history can be found in the hotel museum. This exquisitely renovated 17th century palace in the Albayzín district faces the Alhambra and is in a great location for anyone wanting to experience some of Granada’s nightlife. Only a few doors down is Chien de Andalu, an atmospheric little place where you can experience some flamenco and live music. All bathrooms are decorated with original artisan tiles, and most come with a hydromassage bath. Each room has satellite TV free Wi-Fi, and there are laptops available for guests to use. Guests can also book various beauty and massage treatments. Access by car along the Carrera del Darro is understandably restricted. Approaching by taxi is recommended and the hotel do have an agreement with a nearby public car park (€19.50 per day).